Just like adults, children either are or are not. No middle ground. I only had one true morning child who woke up quickly and happily most every day of her life. The others? Two were especially slow wakers. A lot like me, so I understood but I didn’t necessarily have compassion. After all I was still trying to wake up, too while I started breakfast, dished out reminders about lunches, homework pages due, and answered a hundred questions before the sun had fully risen. I always became increasingly agitated as the clocked neared the moment when we all had to bolt for the car. My adult son, Samuel said the other night on the phone, “I wish my children would act like adults!” I laughed but remembered the feeling well. I longed for more mature responses from my children, not just in the mornings, but after school, during evenings, and on weekends. Gratitude was the quality I was looking for the most. 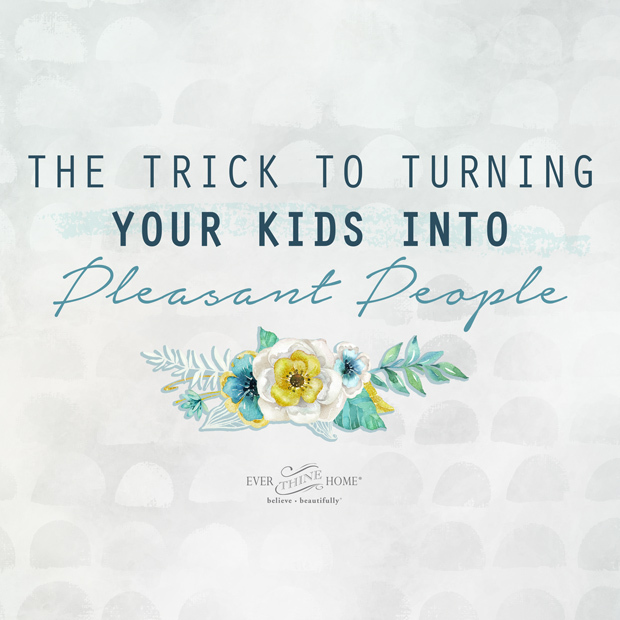 As a busy mom of six, I often felt unappreciated by my kids and sometimes my husband too. They had no idea how much I did or how tired I was or how discouraged I felt. I wanted them to remember to be grateful, whether they liked what I fixed for dinner or not! Grateful people are pleasant people. Even children become more pleasant when they focus on being thankful because the attitude of gratitude realigns our perspectives. It turns our inward looking eyes heavenward. It is God who gives all things, and it is to Him our thanks are due. I wish I had a magic wand for you that would spoof your family into regular gratitude. This idea won’t be that because authentic transformation only comes from Jesus. So here’s a small daily way to start with Him. Place our small simply printed banner in places that can be a reminder to be thankful for your children, and you too by the way. On these increasingly crisp school mornings, let the banner remind you to talk to Him, ask for His power to be perfected in your life and your family. Hang it in the bathroom your children share. Hang another banner in their bedroom. Or hang one on the wall next to the coat closet or family cubbies. All of us need visual reminders of the truth. You as their parent need to be that voice of instruction often enough, but other reminders around your house might give your voice a break and will also echo what you’ve been teaching them without you having to open your mouth and preach. We parents need all the help we can get, right? Gratitude of course is not an attitude God wants us to reserve for Thanksgiving. 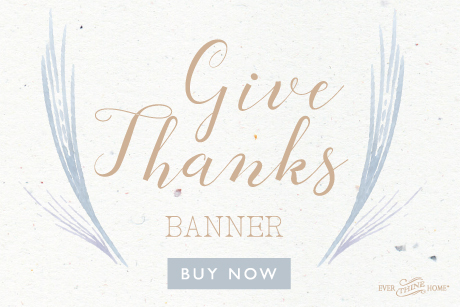 Encourage gratitude in your home every day with our simple little banner. It’s printed in trendy gold ink too! For a more in depth look at cultivating this necessary character in your family, join us for four weeks of gratitude starting on October 30. Each week leading up to Thanksgiving, we’ll share a post full of suggestions, biblical truth, and ideas for teaching thankfulness in your home. Thank you. This is so true about how a short 2-word reply can make a difference. Will definitely take your advice about leaving hints of being grateful in every room in the house. God bless you more wisdom, strength and patience in sharing and ministering to all parents. I am looking forward to finding a reason every day for what I am thankful for from October thirtieth to Thanksgiving Day Amen.